The signs are still there that it is still Christmas. 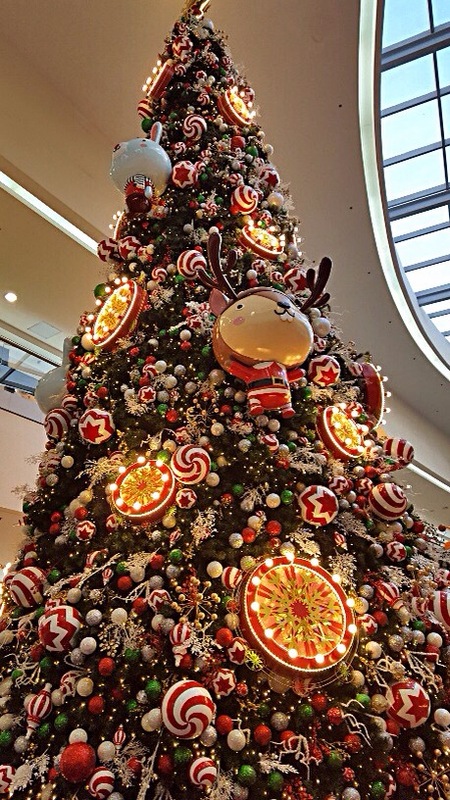 Shopping malls are adorned in glittery Christmas decor. Bright, well-designed Christmas lights festoon the islands of affluent Makati. The bus terminals in the capital city are deluged by passengers determined to get a seat on the bus to get back home while others are at the ports hoping to get a seat on a boat against all odds as tropical depression Usman makes landfall in Eastern Samar. Sea travel has been suspended due strong winds and rain brought by Usman. The roads in Manila resemble slow moving lava at night as cars crawl between 10 and 15 mph. Malls are equally packed with shoppers and window shoppers; supermarkets are still selling Christmas hams. Our doorbell is rang intermittently by young kids singing Christmas carols and hoping to be rewarded monetarily for their mediocre efforts. And the airport terminals are heaving with the arriving tourists and Filipinos working overseas. Ah, it is most definitely Christmas in the Philippines. Yet the Christmas vibe is half vibrant, half fun. 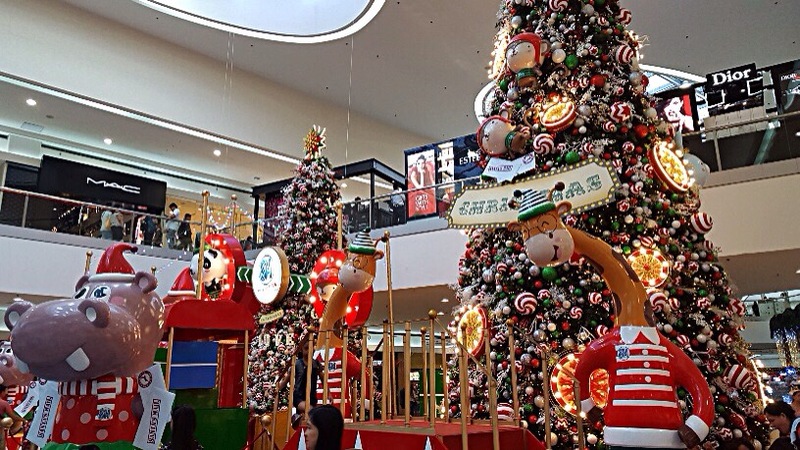 That much vaunted “Christmas is fun in the Philippines” is fast becoming a spectre – if it hasn’t already – of itself as it comes wrapped in a mantle of uncertainty. Switch on the news and it is rife with reports about petty thefts committed in the name of Christmas – the thieves didn’t want their children to be disappointed with the absence of gifts or their dining tables empty on Christmas Eve. The whole country, with the exception of the affluent sector of Philippine society who celebrate the holidays as if inflation and unemployment rate were on an all-time low, is actually struggling to keep themselves in one piece. Stretching the Philippine peso is tearing up people’s minds and souls ceaselessly in trying to make ends meet. This is because while prices of goods go up on a regular basis, the salaries of workers are never equally augmented. Visiting shopping malls like Robinsons Magnolia buffers the harsh reality of Christmas these days. A mall keeps the gore and violence at a safe distance from the tingly feelings of happiness, hope, peace, and joy. One wallows in the comfort of shiny, beautiful things dreamt of, bright lights and fancy signs of aesthetically designed stores, the bustle of people strolling without a care in the world, and the myriad choices in continuous feasting. There is even this wonderfully assembled Christmas tableaux featuring this enormous tree and Tinker Bell appearing and disappearing in a glitter of colourful lights. For two or three hours, with that brief shopping mall Christmas interlude, everything is copacetic in the world and yours. Tropical depressions have come and gone from the Philippines together with the old year, but Christmas is still here. A trip to two different malls attest to this lingering Christmas vibe. 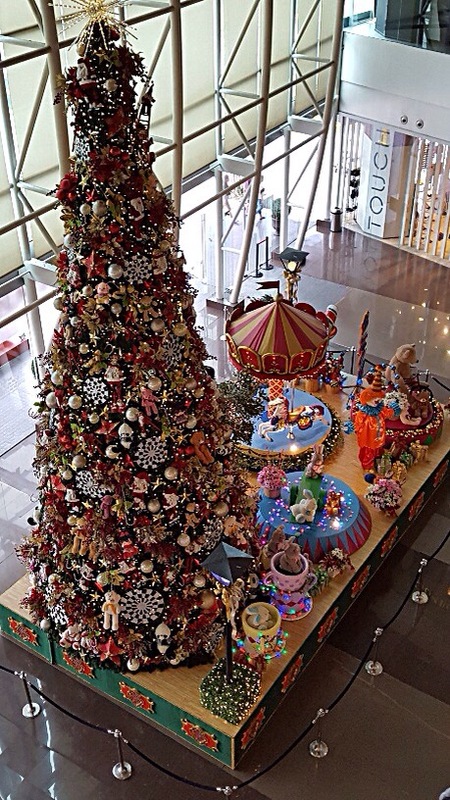 Robinsons Mall on Aurora Boulevard, New Manila has a Christmas ‘centerpiece’ fused with a carousel feel to it coming on every 10 min at the main entrance lobby. 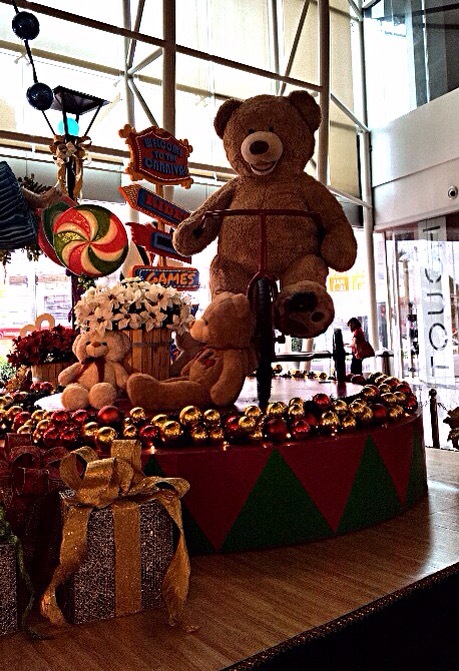 The Christmas light flickers, a gigantic bear rides a bike, and a Christmas song plays on loop. 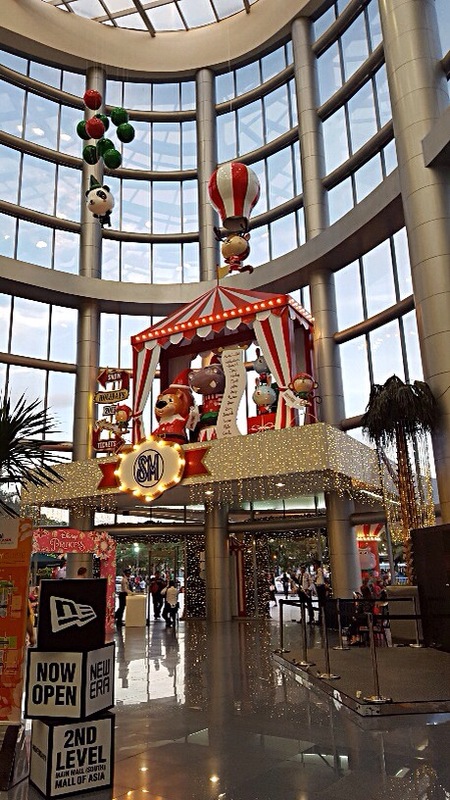 At the other side of the city, SM Mall of Asia, popularly known as MOA, is similarly still decked in its Christmas attire done to the theme of Christmas animals. 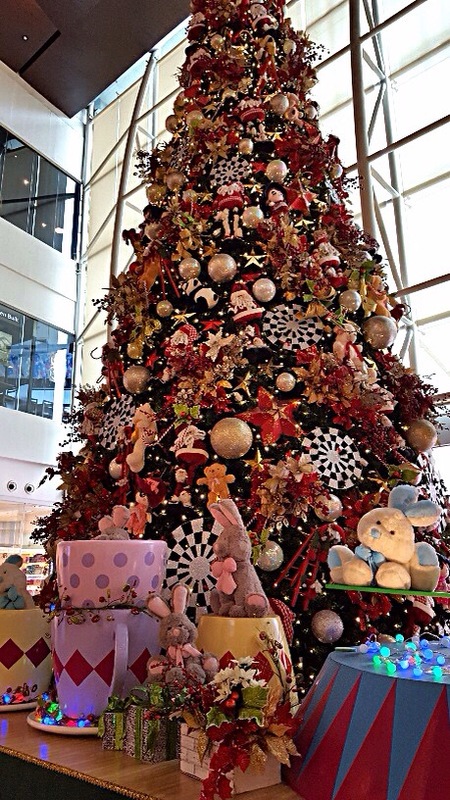 A Christmas tree greets shoppers at the main lobby of Robinsons Magnolia. Without a doubt, the rituals – gift-giving, Simbang Gabi, and Christmas Eve dinner – have been performed yet the Christmassy feel still remains. I suppose this is part of the Filipinos’ much vaunted capacity to be happy in the face of economic crises, natural disasters, and personal tragedies. In fact, a report from the Philippine Daily Inquirer proved this supposition true when Gallup International’s 41st Annual Global End of Year Survey, an opinion survey conducted among 55 countries, placed the Philippines third-happiest country, following Fiji and Colombia. The question that tugs at my mind is are the Filipinos truly happy? Or is it a calculated shift in mindset, choosing happiness over depression or hopelessness given the state of things in the country? I can only surmise that majority of my compatriots choose to be happy because the other options are far grim, and Christmas does help to negate hope against hope. The idea of the birth of Jesus Christ engenders hopefulness and its twin, happiness, which propel people to see their lives vis-a-vis the world in a different light. Another reason is the belief that Christmas isn’t entirely over until the three wise men bearing gifts (or are they kings?) have done their visitation of the divine child. Once that day passes then Christmas is officially over and the Christmas decor can be taken down and stored. The Christmassy ambience slowly dissipates after this then speeds up when students troop to school and all employees report to work. A very strong indication that Christmas is over is the turtle-pace, stress-inducing traffic that confronts the commuters which had disappeared momentarily with the exodus of the population to their hometowns for the holidays. But for now it is still Christmas with the future looking bright. It is best to revel in it before hard, cold reality sets in and locks horns with one’s happiness. Despite the reminder from the police and the barangay tanod (village watchman), my neighbor and his family defied the firecracker ban. But, unlike the previous years, it was noticeably low key and less explosive (read: it didn’t sound like a nuclear bomb). Also, the firecrackers only went off two hours before 12 midnight and sporadically compared with them lighting the ‘crackers at the start of the day and at every hour as they were wont to do before. Their derring-do though exuded a childishness to it. They would light the bangers, the waiting for the arrival of the cops keeping them on tenterhooks. They’d stop after setting off a few firecrackers – shouting with maniacal glee that the police might come any second – then light them again after 30+ min have passed. At one point, the village watchman did descend upon our street to remind the community about the ban. My obstinate neighbors were angelic for an hour after the sudden visit of the village watchman only to return to their devilish way until 12 midnight. Elsewhere in the archipelago, the stubborn defiance to the firecracker ban accounted for “injuries to more than 373 people across the country” on New Year’s Eve according to a report in the Philippine Daily Inquirer. The positive side of this defiance is that there was a 68% drop in the injury cases as compared to last year. The negative side to it is that the victims were still mostly children, for example, an eight-year-old boy from the Cordillera was one of the patients treated at a hospital while it was a much younger child, a five-year-old, at Maragondon in Cavite province. I don’t comprehend this toughness against this ban (there are other issues in the Philippines that need this belligerence) because the celebration of New Year for the past years has gone beyond the border of sanity. It has become murderous. The point of the tradition – something learnt from the Chinese – was to scare the nasty spirits so the new year can come smoothly. But this old perception has long been subverted. Now, innocent merry makers chasing away the old year’s perniciousness have, unfortunately, become almost like spirits too falling victims to firecrackers and irresponsible gun owners who fire their weapons indiscriminately. People have forgotten, or possibly have glossed over, one little detail of the tradition: drive away the spirits by making noise, not put the lives of the merry makers at risk. It certainly looks as if the repressed anger and angst coupled with apathy have reached its tipping point with the way Filipinos foolishly brave dismemberment and death in keeping alive the firecracker tradition. There was no stopping our neighbors as the clock inched to 12 midnight. Their intermittent use of firecrackers was interspersed with loud shouts rallying our neighborhood to join in the festivity ending in peals of laughter that was a mixture of gaiety and intoxication. If the night was a source of immense annoyance, the morning after was equally vexing. 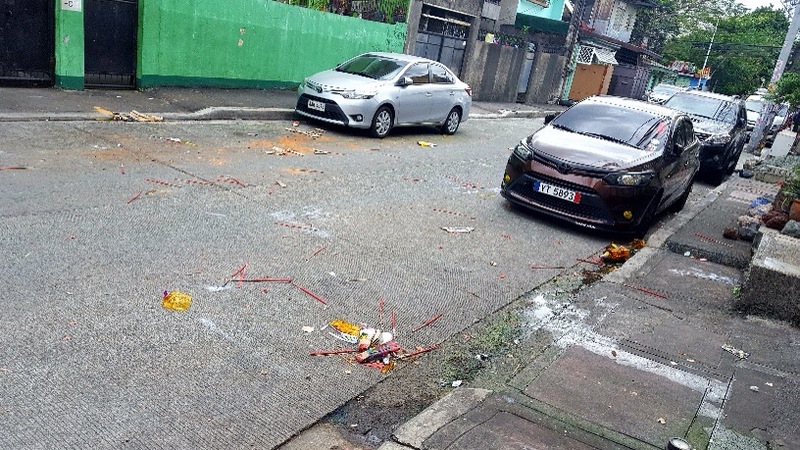 This time our neighborhood had to contend with the trash – remnants of the spent firecrackers and fireworks – which lined the street. The police should also have reminded them of littering. Firecrackers (paputok in Filipino), fireworks, and sparklers are staple accessories during New Year’s Eve in the Philippines alongside horns and clappers. In my childhood, firecrackers were benign with the injury being minor burns if the one handling it was utterly a dunderhead. People could still be out on the street making merry because there was no fear of grievous harm against their lives. 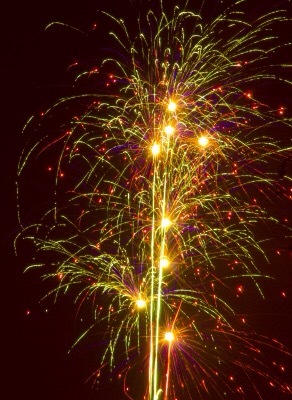 But through the decades especially in the last decade, the firecrackers have gotten bigger and the explosions louder. It was as if the thoughts of the Filipinos, as the years went by, had drastically turned from celebratory to insane and murderous with New Year’s Eve providing a convenient backdrop to let go of pent up angsts through lighting firecrackers that have morphed into semi-bombs. One of the local TV news shows ran an experiment on the firecrackers that littered the streets of Manila. The findings were atrocious because the “dummies” were destroyed. A watermelon used to designate a head was blown to smithereens! The number of injuries escalated as well as the number of amputations done on adult and children rushed to the hospitals, their faces contorted in pain and their hand or whatever limb completely mangled. Hospitals were placed on “red alert” – ready for the casualties to be wheeled in the midst of revelry. The indiscriminate firing of guns by errant cops and owners aggravated the situation. But despite the warnings of the Ministry of Health, medical alerts from doctors interviewed on TV who blatantly displayed the medical instruments that looked like a carpenter’s tools they intended to use on the patients, and testimonies from injured firecracker-users, firecrackers like piccolo were still manufactured and adults and children were still lighting them. I had come to dread even fear New Year’s Eve because I was put on edge with every “detonation” especially by our neighbor who started lighting firecrackers any time of the day weeks before New Year’s Eve. My family and I were jumping out of our skins with every boom and maniacal laughter that accompanied it. But this year’s New Year’s Eve celebration might buck the usual ghastly turn it takes. The cops’ message is much welcomed and well received because, for the first time in ages, people in my neighborhood – people and pets – can now truly enjoy a joyous New Year’s Eve. This is, naturally, much to the chagrin of my daffy neighbor, but to my sheer delight. Mantle’s words hurled me back to my school days in JASMS, Quezon City. Its founder, the late Doreen Barber Gamboa, espoused, among other things, learning to be one’s self and standing alone without being lonely. Gangs, roughly barkada in colloquial Filipino, existed in JASMS and so did the regular bullies that inadvertently pushed the bullied to seek gangs. There was this gravitation of students into a barkada not for their teeming cowardice, but the overabundance of sensitivity of others for people pushed to the margins of school society. Being bullied was a common denominator that eventually led to other points of commonality. In my case, my friends and I found each other because of a tacit understanding that there was nothing wrong with varying personalities and interests. Propitiously, we discovered we also shared a fondness for studying, for reading, for Pierce Brosnan in Remington Steele, for movies like Sixteen Candles and Pretty in Pink, etc. It also helped that we were big on talking things out, addressing issues in a rational manner instead of drowning ourselves in telenovela emotional drama. The definition of belonging in JASMS was being accepted for one’s warts and all, which included opposing political views, absence or presence of faith, and pendulous mood swings. Each student found a barkada she or he could be herself/himself without the pressure of transforming into someone else supposedly more acceptable. But wrongdoings or acts of violence and destruction were not enabled or tolerated within a barkada, and one was free to seek out new friends if the former barkada proved, in a manner of speaking, stifling. Leaving a barkada was done without the Hollywood scenario of seeking vengeance or further bullying or overdrawn histrionics. There was either this cordial acknowledgement of the other or the opposite, complete obliviousness. The glue that held my barkada – we called ourselves JAMMERS, a word formed from the first letters of our names – was acceptance of each other’s strengths, weaknesses, and idiosyncrasies fueled by common life philosophies that boiled down to always being on the path of goodness that is capacious for committing and learning from mistakes. This path also included space to chart one’s own path, to stand alone and face challenges buttressed by the knowledge that the barkada – JAMMERS – would still be there even if the the meet ups are far and between and intermission communications relegated to social media. It has been decades since I experienced having no access to Wi-Fi. This was in Myanmar when I still worked for Frequent Traveller, a now-defunct business travel magazine published in Singapore. Internet was only available in hotels which was equivalent to having no Internet at all because by the time a website loads your bill would have looked like you spent hours on the computer. But I wasn’t really bothered by the absence of Internet. On hindsight, it was a welcomed respite from staying connected and from checking the phone for e-mails. Truth be told, I belong to the old school of communication – face-to-face was how I like interacting with people. Nowadays, the mere thought of any venue having no Wi-Fi is just unthinkable. Indonesia is just as wired as Singapore down to their respective airports. America is a hit-and-miss; some places have and some don’t. As for Manila, I eschew using the Internet when I’m out for fear of hand phone snatchers roaming the malls. I do make an exception when I’m at cafes. Starbucks, my preferred coffee place, was a tad dark when I stepped into its Matalino Street outlet. Fortunately, Seattle’s was just next door which was brightly lit – it looked “happy” not brooding – but, to my surprise, was without Wi-Fi because of a cable problem, related the cashier. I took it for granted that by the time I returned the cable problem would have been fixed. After all, it is de rigueur to have Wi-Fi anywhere now much like it’s de rigueur for hotels to have buffets and free Internet. Have a classic mocha By Seattle’s on a rainy day. Seattle’s seemed unfazed by the absence of Wi-Fi and so were its customers including me. As I watched the rain lash at the cars and the umbrellas moving to and fro within my vision, I noted the more relaxed atmosphere as people marched inside the cafe. When I was there for four hours, people came to have coffee or order coffee and food to-go. The customers were variegated, I noted, as I sipped my classic mocha and bite into my cinnamon roll. Two nuns held my gaze when they entered Seattle’s because I was flabbergasted at the thought of holy women chilling in a café. I noted an elderly woman changed from a dress into a shirt and trouser ensemble, and claimed a corner as her own with a newspaper. A young man came, armed to the gills with his gadgets, and parked parallel to my table; with his paraphernalia were all set up, he was fast asleep when I next peeped. A lone man came and sat at the back of the room to nurse his Americano. Two healthy cats walked up and down Seattle’s and its neighbour Kenny Roger’s. Two women and their children had a little reunion at one area. A couple came to have Seattle’s skillet meals of sausage and eggs mid-way to lunchtime, and the man almost left his hand phone on his chair which fell out of his trousers that people in the medical field wear. Gone was the busy din of a café that, I realised later on, agitated the coffee drinks. Seattle’s was quiet-busy with upbeat Christmas music playing on the loop overhead. Conspicuously absent, and not to my chagrin, were the millennials strapped to their hand phones. 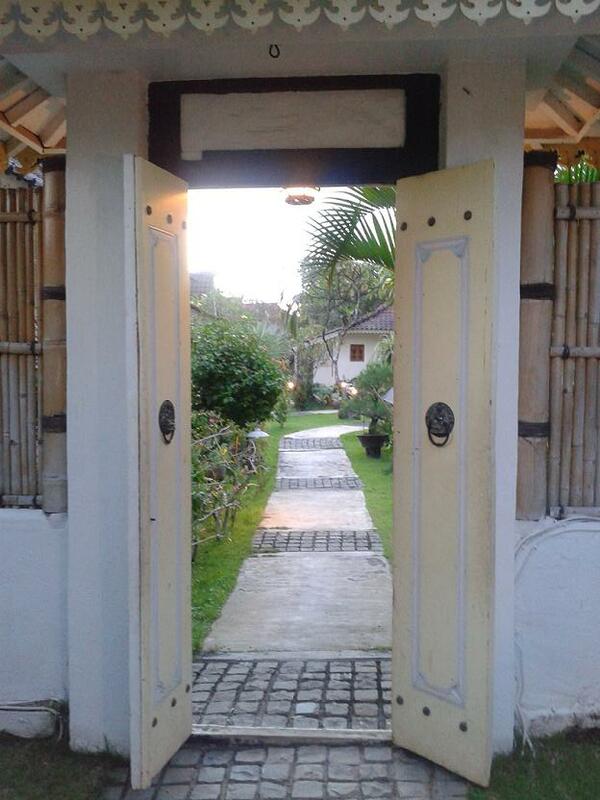 There was this calming quiet enveloping the café. No one was taking selfies or photos except for me when I discreetly took shots of my orders for my blog. My thoughts just flew here and there as I spent the time organising the new sets of vocabulary for the new semester and discovering what was troubling the governess of Miles and Flora in Henry James’ “The Turn of the Screw”. The feeling I had could be summed up in the Japanese word natsukashii: “of some small thing that brings one suddenly joyously back to fond memories not with a wistful longing for what’s part, but with an appreciation of the good times.” That small thing was definitely the lack of Wi-Fi which didn’t figure during my growing up years. That very thought was soothing because Wi-Fi was never a necessity like air or water. I survived school and first-time employment without Wi-Fi. My existence didn’t revolve around Wi-Fi; my high school friends and I knew what it meant to be in the experience and to enjoy it. I don’t deny that Wi-Fi has its advantages if we’re talking about work, but outside of work is a different story altogether. There is some goodness to solitude in a café with a book and a meal, say, herb omelette with French toast. It’s an experience these millennials should try. A reality I envision myself fervently in is where I am looking as lithe and graceful as Plana Forma instructors Celine Encarnacion, Dani Cornejo, and Bernadette Osias. I’m elegantly lean as, together with either one of them, I extend my leg – toes pointed – back up in the air or the side like a ballerina. But alternate reality is mythical and I crash back on Earth struggling to hold my leg up or maintaining the half-way “sitting” position while pulsing for three counts at the barre. Barre workouts belie an effort that would make a grown-up cry. I’ve been keen to attend such a class ever since I first got wind of barre workouts from an FB friend who is passionate and passionately posted pictures about her barre classes in Kuala Lumpur. I was on the lookout for a place to exercise while on vacation in Manila, waning something different from my usual gym workout. I found my answer at Il Terrazzo in Quezon City where Plana Forma’s second studio is. “It’s a combination of Pilates and yoga, which you are familiar with, but we go deeper and concentrate on the little muscles. Give it a try,” said Celine encouragingly before leaving the studio. Her warm welcome and succinct explanation of the Plana Forma concept had me signing up for the Newcomer package of 10 classes. Plana Forma, I read on its website, is a ballet barre technique that merges the precepts of yoga, Pilates, and dance into an hour’s workout at their Plana Forma studios at Makati or Quezon City. Class reservation is done via mindbodyonline.com; you get a confirmation email after signing up. Important rules to remember are to show up 15 minutes before the class or your slot would be given to someone on the wait list; and to bring your non-slip socks (sold for PhilP350 at the counter) for Forma classes, trainers for Zumba, and yoga mat for Forma Asana. You can stow your things in a borrowed locker and ask for towels (big or small) before the class. The studio closes shortly before lunch and opens before 615pm. Thigh warrior beginners are advised to attend the Forma Core class to get familiar with the form, techniques, and breathing. I followed the advice and signed up for Van Manalo’s class that was packed to the rafters on an Eid Mubarak Monday morning. The push-ups were a cinch but the thigh workout, which came after the fast-paced, upbeat warm up, was more than challenging. Fortunately, my personal trainer had me do endless squats because I wouldn’t have lasted during the first set of eight half squats – visualise sitting minus the chair – at the barre. Don’t forget your non-slip socks for the Forma classes. It begins with students getting their two pairs of dumbbells – one heavier than the other – from a shelf near the music console for the warm up. Next is locating your spot at the barre that is already set up with a yoga mat, square cushion (aka square mat), black strap hanging from the barre, a blue ‘playground ball’, and a rolled-up thick blue mat. The endings are stretches that target the IT band (iliotibial band) and yoga poses for the upper body. 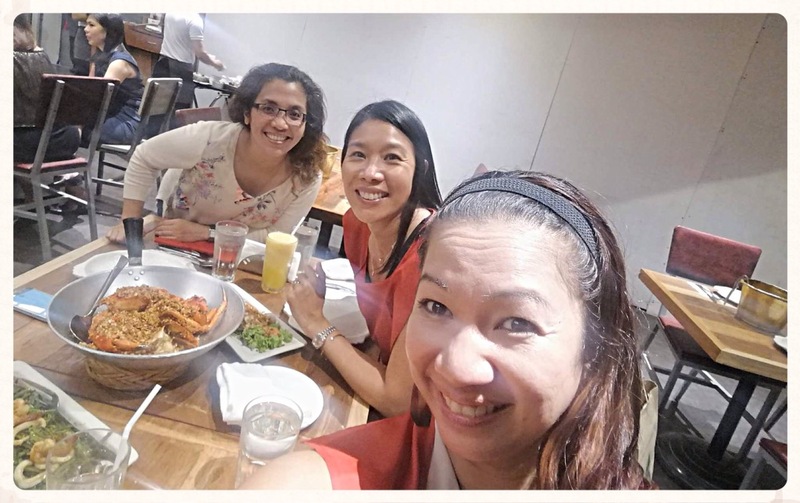 I attended two Forma Core classes – the other one with Dani who was less of a comic than Van but still peppy – just to get the routine down pat and then upped the ante with Forma Core+ with Celine who struck me as the geek of all the instructors. Her directions were accompanied by explanations of what is supposed to happen or is happening to the muscles complete with their scientific names. But just like Van and Dani, she was animated and had her signature quip “Beautiful” to compliment her students whenever they executed a movement well. Satisfied that I wasn’t lost in the routine anymore, I ventured into other classes viz. Forma Endurance, Forma Strength, and Forma Mi.X.ed. I met Celine again in Forma Strength that led to epiphanies about bikini bottom muscles and quivering legs: using your own body weight and engaging the core muscles should be the fitness goal from the beginning. If you can carry yourself in an exercise class, you’re on the right path to fitness. Moreover, little movements are more effective in getting those core muscle tight and strong. I credit my personal trainer for getting me in shape for Forma classes – I can keep pace with the instructors even though I may look like a gorgeous elephant projecting as a swan. “The face shouldn’t scrunch up like your abdominal muscles. Open the chest, relax the shoulders, and smile. Good morning!” he’d say innocently but with a hint of cheekiness, as we went about pulsing in half-squat position, squeezing the playground ball in between the legs, at the barre. He also had a signature spiel which would either be “Perfect!” or “Good morning”; at times he’d blurt out “Thank you” like a polite school boy if everyone followed his suggestion of, say, raising the arms to the sky for a more challenging mid-section workout. I found my stride in Clark’s class, following seamlessly in working the core muscles because the tempo was similar to my gym pace, plus I got lost in his music accompaniment of mostly 1980s songs. Bernadette’s Forma Endurance proved challenging. I was gobsmacked that I was hard pressed to pulse my left leg which was bent at my back while in a seated position as I held the barre. It looked easy but reality was far from it. Bernadette was the strict one; her voice exuded that martinet schoolmarm vibe andshe was very particular about everyone following her instructions to the letter including where you should face for the non-barre exercises. I’m down to my last two Forma classes and I’ll be going back to my regular workout. It doesn’t mean that I’m eschewing what I’m taking home from my Forma classes. On the contrary, I’m stoked to continue as an autodidact thigh warrior and work on my goal: Be a strong, elegant thigh warrior. You’re not diagnosed with any debilitating illness. In fact, the last blood work you had showed you are most certainly in good health. Your doctor was pleased that you managed to keep the cholesterol level down because you stayed away from fried food and other lip-smacking but cholesterol-laden dishes. Good for you! You exercised regularly, too, and you still do. Didn’t your personal trainer remarked how stronger and leaner you have become? Rejoice! 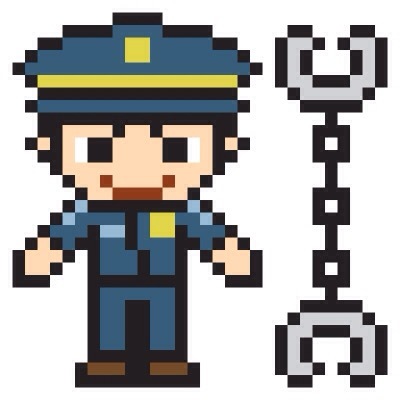 You are in tip-top shape. So, why do you feel like the world is one bleak wintry landscape that you always wake up to? You find your self-made routine repetitive and monotonous, but it shouldn’t be. It’s the routine you set up for yourself being the creature of habit that you are. Reading has always been your solace – it still is except you find yourself less spirited than you started out. You have always managed to come out of the book you immersed yourself in unscathed, but this time you pushed the book aside, hoping to pick it up later, when you started feeling like Madame Bovary and how the world weighed heavily on your shoulders. Working out has become the crutches you cling to with tenacity except about a week ago you were ready to throw them away. Eating has become mundane; if only you could go on without repast and not get vertiginous. Social interaction, you realise, is tiring, to say the least. You want to engage people in conversation except you seem to know the outcome having written the scene in your mind. The ending is always the same; you leave feeling as if you never had a conversation at all. Worse, you feel ostracized. Yet you try and push yourself socialise, only to end up absolutely empty at times. Then you start to question yourself – are you going mad? Have you joined the ranks of the living dead? Solitude has never been a problem with you. You actually revelled in solitude. You left your world every now and then to re-join society and returned when you felt you’ve had enough. But lately, it’s different. You dread stepping out of your world because you don’t see any point in the exercise. “What’s up universe? Another one of your pranks?” you mumble to yourself. Homecoming is such a bittersweet affair for Filipino OFWs (acronym for overseas foreign workers). They are welcomed as modern day heroes upon coming home (think remittances), but there is much less love when they depart. It is one queue after the other that an OFW has to hurdle in order to exit the country and return to work. One questions why hailed heroes are made through go to such lengths to exit especially when their documents are sound. Why can’t information be disseminated clearly and widely? Why can’t everything be done in a one-stop? Why is the process so convoluted? Queuing begins with securing the all-important OEC (Overseas Employment Certificate). There is still love felt when lining up for the OEC at POEA Ortigas or its satellite branches in Trinoma, Quezon City, and SM Aurora because the goal is to get it over and done with as soon as possible. After all, once that document – in triplicate – is within one’s hands, it is sweet vacation all the way. This is, of course, granted the computers didn’t break down, the employees came on time, and you were aware of the new ruling that only Balik-Manggagawa (BM) Online appointments would be entertained at the Trinoma QC branch. 7Walk-in applicants were turned away and told to book online by the security guard on the day I came. In fairness to POEA, there is announcement at the entrance of the Trinoma branch, but too bad if you weren’t within the area in May. Booking an appointment online is another queue an OFW has to conquer because, at times, the site is unavailable due the voluminous traffic of OFWs trying to book an appointment! Adding to the frustration is discovering that your records are not updated: enter the old OEC number and the annoying response is “number not found”. Go figure. The illness-inducing aggravation begins with the journey to the airport which, depending on the flight, could begin at the crack of dawn. Traffic snarls are a constant worry because one can be stuck on the highway for hours and miss the flight. Take the gown designer, reported in the Philippine Daily Inquirer, of Ms Universe Pia Wurtzbach, who missed his flight to Los Angeles because of the bumper-to-bumper traffic. He said he wanted to get down and run to the airport, brimming he was with glorious purpose of delivering the gown to the Philippine candidate. The next queue is for the terminal fee payment. This was, surprisingly, quick because this time a stamp on the boarding pass and you were in the immigration area where, unfortunately, was another meandering column. One isn’t home free. After exiting immigration is another line – security screening where instructions get a bit muddled. A sign says there is no need to take off the shoes, which everyone followed to the letter, but only to be told later by one of the airport staff, when you’re about to be frisked, that shoes have to be taken off and placed on a tray for screening. Queues are still in place at the departure lounge. First is the line for the terminal fee refund stand in front of the Duty Free shops. The line is as long as one’s shoelaces. Next, when you’re raring to relieve yourself, you just have to hold it in until there is a cubicle available at the lavatory. Third, if you are famished, lines at the eateries are never short. The final line? There’s still the queue to board the plane assuming that the plane is connected to the departure gate. But if it isn’t, you have to line up to get to the bus and then stand in line to get to your seat in the plane. With what an OFW has to endure in returning and leaving home, I can’t help but wonder if there is a subconscious animosity towards people working abroad. The whole set-up is screaming a patronizing attitude of “Pagtiyagaan mo nalang. (Make do with it. )” Seamless queuing per se is not a problem as it shows order. What is riling is the lack of foresight and strong commitment in addressing perennial issues particularly the disproportional number of OFWs to the employees deployed at the airport and the OEC centres. Another is the work hours and days not extended during Christmas and New Year. Trinoma, for example, was closed OEC for online appointments until January 11. Why are the OEC and the process of securing it an anathema to the OFW? Solitude is an alien concept these days. Let me rephrase that. The concept of solitude has been inadvertently undermined amidst the ubiquity and garrulousness of the world on all of the social media. It has, sadly, transmogrified into the cringing absence of communication because everyone’s busy checking the timeline or posting updates and photos or scrolling through the chat history, if not typing a message or nonsensical comment. Solitude has become isolation in the midst of connections which is strange to the point of ludicrousness. A generation ago solitude meant getting away from the madding crowd to collect one’s scattered thoughts or piece together one’s frayed soul and tattered confidence. Some left to look for hope and a sense of purpose while others searched high and low for determination and patience. One left the world for a moment that defies measurement. Let’s frame it this way: one filed for an indefinite leave of absence from the world to be whole again. My journey of solitude begins with a trip to a tranquil place where the only sounds are the morning greetings of insects, chickens, and birds, and vehicles plying the road after the crack of dawn. 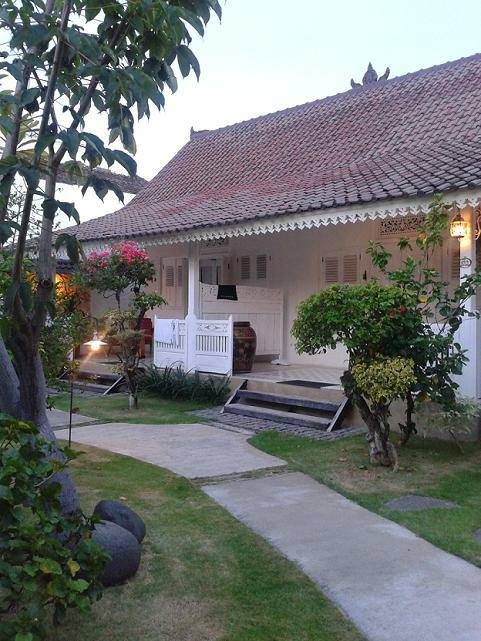 There are also the silent salutations of the bougainvillea and frangipani day in day out. 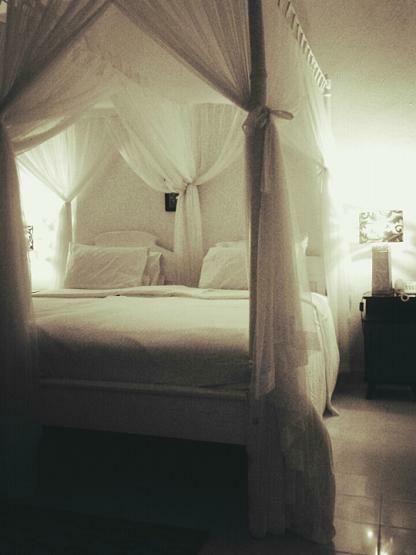 This is, naturally, dovetailed with a room of my own fitted with a bed that invites and promises deep slumber and days peppered with quiet time. Accompanying me on this trip are mostly books that have been neglected a while. I have this mental list of reading that I need to accomplish but, unfortunately, get derailed with both mundane and important things to do. The books though are literally arranged neatly within my field of vision at my place so whenever I pass by I am reminded of what I have to and must do. I have a self-imposed moratorium in buying books because my situation has become a case of tsundoku, or buying books and letting them pile up unread on the shelves, floors, and nightstands. 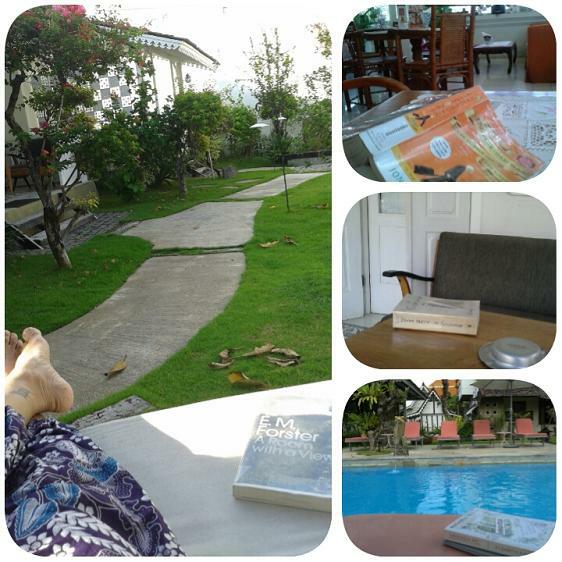 Apart from books, my entourage also comprises of either my iPad or laptop and mobile phone. The former is for blogging and the other is for texting home. The recluse in me needs to get away from the human vagaries that more often than not leave me enervated and almost completely jaded. I need to find stable mental and psychological ground so I can calm the anxieties and fears, and stoke to life the nearly fading embers of hope in humanity and life. Solitude affords me that opportunity even if for a moment.